The Uganda climate is good in Uganda all year round – hot and wet, daytime temperatures generally hovering between 20-30 C. It cools down at night; enough for a jersey but woolens are not necessary. The rains come twice a year, in October/November (short rains) and Mid-march to end of May. Rainy season is no reason to postpone your travel however, as generally it rains for an hour or two and the rest of the day is clear and sunny. So there is no need to worry when to come to Uganda. This applies to Rwanda because both countries lie in the equatorial regions. Temperatures in Rwanda fall a little bit low because it lies on a higher altitude compared to Uganda but still the change has no effect to a visitor in Rwanda. Ugandan visa fees were increased with effect from 1st July 2007 as follows. Currently there is one International Airport at Entebbe the country's hub. A number of international airlines fly direct to Entebbe, among them include, British Airways, SN Brussels, Kenya Airways/KLM, Emirates, South Africa Airways, Egypt Air and Ethiopian Airways. Emirates with daily flights will fly to Entebbe and will link to the whole world. Most major towns have airstrips, as do most National Parks and Game Reserves. Charter flights are available with small aviation companies. We arrange them on request privately with those clients that that prefer charter holidays like or are limited with time. To a small scale they operate scheduled flights. Ugandan Shilling is our currency and convertible. It is advisable to carry Cash American US dollars, Euro, British Pound or Travelers’ Cheque. There are numerous Forex Bureaux and International Banks in the capital city – Kampala and the main towns. Credit cards are accepted in major hotels and restaurants and can be cashed to limited amount per day at the counters of international banks. There are ATM machines that can cash some credit cards. 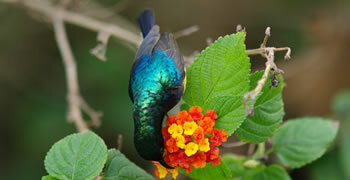 It is generally best to carry cash- shillings upcountry as you may not get places to carry out exchange. It is advisable to carry USD dollar notes from year 2000 and above as below notes may at times not be accepted and fetch high bank charges. Note to be in denominations of 100s and 50s, small bills are not acceptable and fetch low exchange rates. Light clothing, hats, and sturdy shoes. Long sleeve shirts for evening. Sweatshirt or fleece for evening's upcountry. Uganda's position on the equator suggests a need for sun cream. Also it is advisable to equip yourself with insect repellent. Women in rural towns may feel more comfortable wearing clothing that covers their knees and shoulders, but this is not mandatory. It's usually hot by midday, but evenings are always pleasant. The warmth of Equator and the cool breezes of natural forests and Mist Mountains generate a tender climate throughout the year not to be enjoyed anywhere else in Africa. Tracking gorillas will require you to long pants - Jeans and long sleeved shirts and blouses, rain gear- water proof jacket or rain coat that will protect your cameras from rain. Rain in Bwindi Forest daily is almost a must. Te terrain is steep and sturdy shoes are recommended. 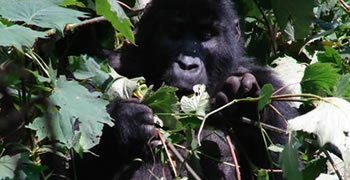 The minimum age for Gorilla tracking is 15 years. And each permit costs $ 500 per person per day for Bwindi National Park, $500 for Mgahinga National Park, and $500 for Park de volcans Nationale in Ruhengeri. 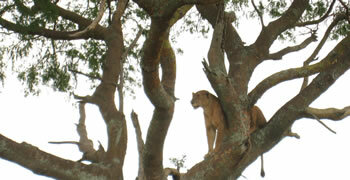 Other parks where wildlife viewing is done are paid 35 US dollars per person valid for 24 hours.